As far back as at VMworld 2014, VMware announced VMware Project Fargo technology, also broadly known as VMFork. It allows to make a working copy of a running virtual machine on VMware vSphere platform very fast. While VMFork works, a short-time suspension of VM (quiescence) with “fast suspend resume” (FSR) technology takes place. After, the child VM separates itself from the parent one, and VM reconfiguration happens, involving new MAC-address assignment, receiving new UUID etc. At the same time, VMs share common resources and have their unique write areas, which very much reduces the resource cost for one VM on the host. After the new version of VMware Horizon 7 desktop virtualization platform was released, the VMFork technology was renamed into Instant Clone and became available for use in the production environment. Apart from the reduction of the resource cost for virtual machines allocation, Instant Clone has several more benefits, which make virtual machines deployment more flexible and fast. We are going to consider the characteristics of these processes below. Together with the application delivery technology through the VMware App Volumes 3.0 plugged virtual disks and environments management tool called User Environment Manager, these functionalities allow users to get instant access to their data. At the same time, user’s working machine is not littered with unnecessary installed programs and growing registry branches. All of this helps to build user’s desktop on-the-fly of fully customizable “building blocks” delivered on demand. Instant Clone is convenient for virtual desktop infrastructure administrators, because these desktops don’t need Refresh, Recompose and Rebalance operations. The reason is that after the user logs out the VM, his desktop is deleted, and linked clones recomposition is not needed. Basic image changes on-the-fly within the working day, and with next login the user gets updated applications. Also, there is an option of forced user’s relogin for virtual desktop update (for example, urgent fix in a security subsystem). Also, the need of Content-Based Read Cache (CBRC) technology use is eliminated, as far as Instant Clone virtual desktops exist for a short while and are always unloaded from the memory when user logs out, and there is no need to “warm up” the cache with their blocks in memory. At the same time, CBRC is used for Master VM and replicas. Besides, wipe and shrink operations for SEsparse virtual disks, which allow to return growing disk space for linked clones, are not needed anymore, as well. 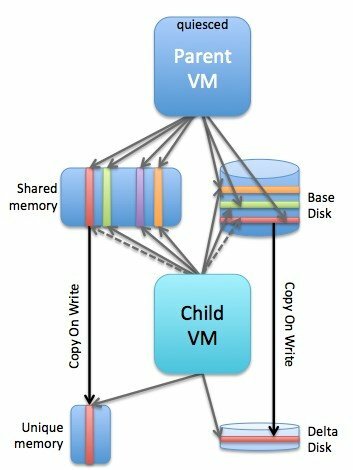 Instant Clone virtual machines exist for a short while, and when they are deleted, their delta disks space is returned to the shared storage space pool. And, in contrast to the View Composer, the Instant Clone technology doesn’t require availability and support of database for operations with virtual desktops, which very much simplifies virtual desktop infrastructure maintenance. Create parent virtual machine, install Windows in it, optimize it, and activate it with a license key. Install VMware Tools inside a VM. Install Horizon Agent and check Instant Clone feature for installation. When creating new virtual desktop pool of Automated/Floating type, choose Instant Linked Clones. Aside from the fact that with Instant Clone the process goes in fewer steps, the load on different virtual infrastructure components is also reduced – there are less input-output operations, the snapshot creation process is faster and system resources are deallocated faster, and there is a reduced number of vCenter server interactions. Also, the disk space is freed immediately after using virtual desktop. To find out how much faster it works let’s check out some testing results. The deployment of View Composer linked clones of typical configuration (2 vCPU, 2 GB memory, Windows 7, Office 2010, Adobe 11, 7-Zip, Java) on 15 host-servers with HDD-disks takes nearly 150 to 200 minutes. The same deployment of 1000 of virtual machines based on the Instant Clone takes only 25 to 30 minutes. So, the provisioning of hundreds virtual desktops in a new infrastructure on demand becomes 5 to 7 times faster. At the same time, the load on VMware vCenter server doesn’t increase much. Of course, at the beginning there is a peak load on vCenter at operations in RAM with VM snapshots. But, in the end, the average load is almost the same as with View Composer, because there is no need in repeating powering on cycle and undergoing virtual machine reconfiguration cycle for 3 or 4 times, as it is with Composer. At the end of the day, in some cases Instant Clone is the best solution from the viewpoint of performance. When you need to get virtual machine as fast as possible, and the user doesn’t need it as he left it – the Instant Clones will help to speed up the process by several times. An example of this use case is a call-center, where the operator uses the virtual desktop to tackle some technical support’s task, and afterwards logs out that causes to deleting of unnecessary entity (his temporary VM).